If you live in South Florida as I do then the name Goody Goody probably doesn’t mean anything to you. 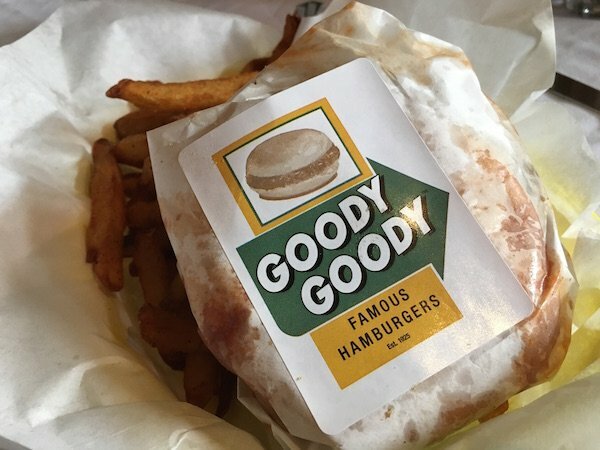 Now, if you mention Goody Goody Burgers & Butterscotch Pie to folks in Tampa you’ll get a totally different reaction. For comparison, it’s similar to what happens to old school Miamians when talking about Royal Castle Sliders and their legendary Birch Beer. Goody Goody closed up shop in 2005, seventy-five years after that location had originally opened. And just like that it was gone…..or so everyone thought until Richard Gonzmart (Columbia Restaurant Group) spent nine years of off/on negotiations to make sure he would be able to carry on the legacy of Goody Goody in Tampa. 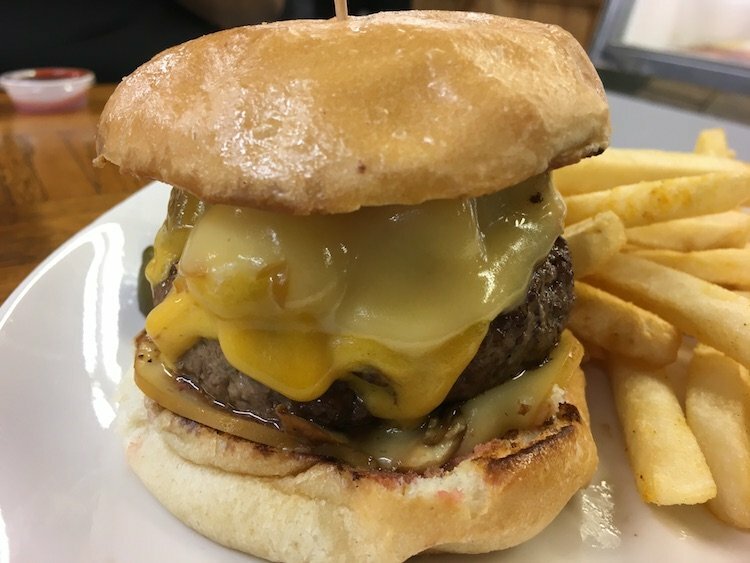 I was one of the lucky few to have been invited to try out the Goody Goody Burger, Fries and Shake(s) at the test kitchen in the Columbia Museum. We (my wife Marcela & my bud John) were offered either a Vanilla, Chocolate or Strawberry Shake. We each opted to choose one flavor, mine was Chocolate. The Ice Cream for the Shakes is made in house so I knew what I was in for. My favorite in order of preference was Vanilla, Chocolate then Strawberry. Nothing really against Strawberry but I’ve never ordered one in my life. I’m mostly a Vanilla guy with Chocolate on occasion. 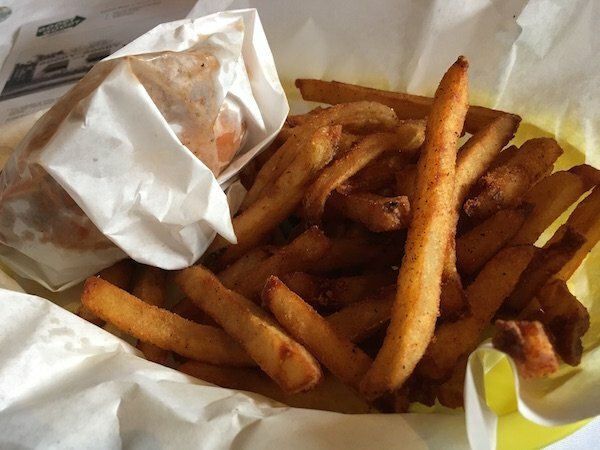 The fries are fresh cut and seasoned after frying with a mix of spices. You can’t go wrong with fresh cuts. I asked about either a Cheese or Chili Cheese version and was told that yes, they will be available when the actual store opens up. Next time I gotta try stuffing them into the Burger. So the Goody Goody Burger is placed before me. I take in its beauty and flip it and remove the bottom bun to look at the sear, it’s a nice one. 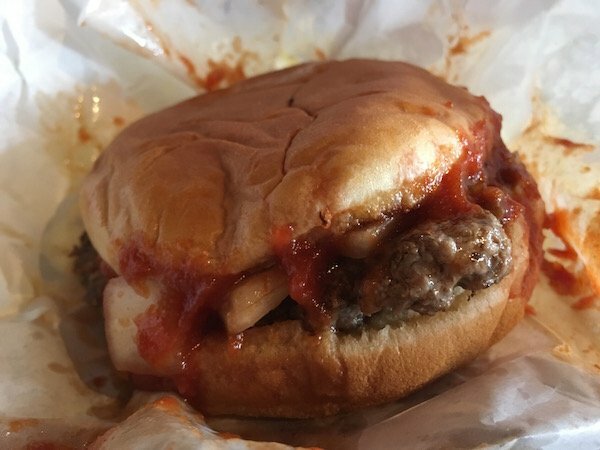 The Onions which are given a rough chop along with some Pickles and the Goody Goody Sauce make up the contents of the Burger. I hadn’t mentioned but it’s definitely important to that the Beef is fresh and locally sourced. On my Instagram post, I said it was “incredible“. It is unlike any Burger out there which is a good thing or should I say a Goody Goody thing (Sorry I couldn’t help myself). Unfortunately, I wasn’t able to try the famous Butterscotch Pie but that leaves me with a good reason to return when they open up in the next couple of months. 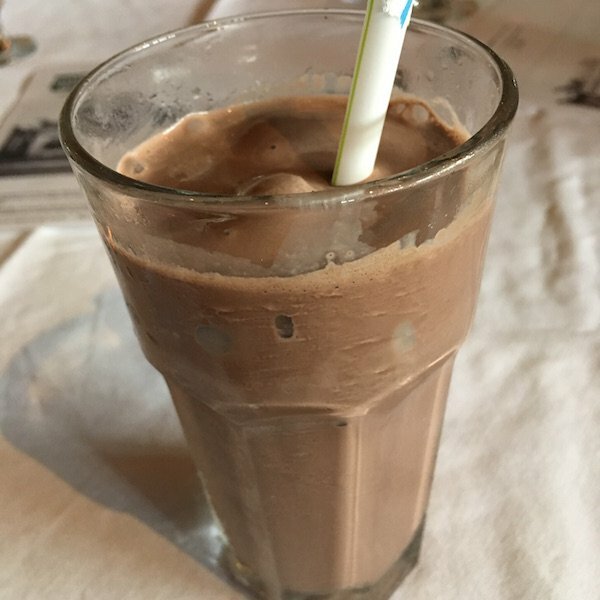 I’ve gotta thank the Columbia Restaurant Group, the Goody Goody Hamburger folks including Chef Dave Ellis and Jeff Houck for setting it up & giving us a historical perspective on everything (which is always important). I can still taste those thick-cut fries and that yummy burger with onions. I’m wondering how close they are able to reproduce the original taste. I’ll be planning a visit soon. They have a high bar of expectation. Can’t wait. Had my Goody burger and butterscotch pie yesterday, the second day of the opening. I enjoyed it but I have a couple of suggestions/comments: My bun bottom was wet, not good(y). Maybe the sauce needs to cook down a bit more? I missed the flavor of celery seed, but maybe my taster is off. I ordered with cheese but it came without, no big deal since I really wanted it original anyway and I understand they’re so busy a few small kinks are unavoidable. Service was OUTSTANDING. Made me want to go back to work as a waitress, or even a busser…they looked like they were having a great time. (so not happening at my age). The pie: The meringue was lovely to look at and very tasty, more dense than a typical meringue but really good. The filling did not remind me of butterscotch, and while it was good, it was basically sweet custard. It needs something. I ate the pie first, and then the burger because I’m just not as big an eater as I once was, so I really had an appetite worked up. I’m going to give them many more tries, because I really, really miss Goody Goody. The place is beautiful, and serving breakfast all day is brilliant. They will be mobbed on Sundays with the church crowd alone, since not too many choices besides the always crowded Village Inn and I-Hop.